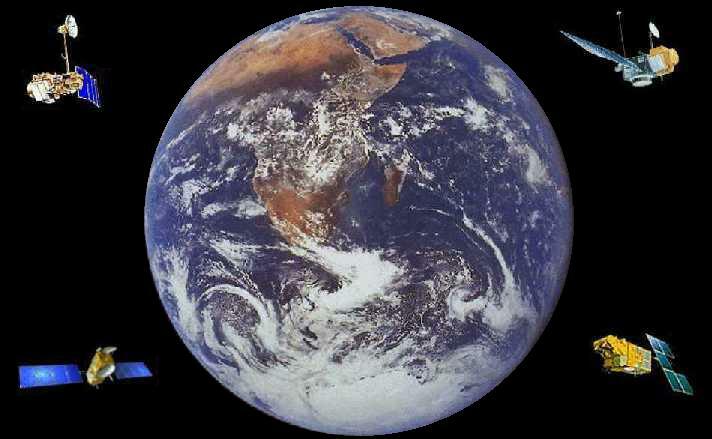 Remote sensing deals with the art and science of observing and measuring items on the Earth’s surface from a distance. By this definition remote sensing encompasses the field of aerial photography. The term, “remote sensing,” was first introduced in 1960 by Evelyn L. Pruitt of the U.S. Office of Naval Research. However, the first aerial photograph was taken in 1858, 102 years before the term “remote sensing” came into existence. Long before satellites and microcomputers started dominating the field of remote sensing, people were taking pictures of the Earth’s surface from afar. Taking these pictures was not an easy task and people risked their lives to bring about the development of the field. To appreciate what was involved, a brief history of aerial photography is provided in this unit. FIGURE 1: First known photograph, taken in 1827. In 1827, Joseph Nicephoce Niepce (pronounced Nee-ps) reportedly took the first photograph. He was fascinated with lithography, but unable to draw, his artist son made the images for Niepce's work. In 1814 his son was drafted into the army to fight at Waterloo, and Niepce had to look for another way of obtaining images. Eventually he developed a product that he called Heliographs. His first picture (Figure 1) shows a view from his studio window and required eight hours of exposure time. The picture is difficult to decipher. With the exposure lasting eight hours, the sun had time to move from east to west, appearing to shine on both sides of the building. On January 4, 1829, Niepee entered a partnership arrangement with Louis Jacques Mande Daguerre but the partnership lasted only a few years with Niepee dying in 1833. Daguerre continued their work and in 1839 announced the development of the process called "daguerrotype." The early daguerreotype pictures had several drawbacks, one of which was the length of the exposure time. The below photograph (Figure 2) illustrates the problem. This photograph, taken from the roof of a tall building, might be considered the first oblique aerial photograph. Taken in 1839, the photograph apparently shows an empty street in Paris during the middle of the day. Due to the long exposure time, moving objects such as people walking and wagons moving were not recorded. The one exception is a man who stopped to have his shoes shined (see bottom left enlargement in the large picture). Over time the daguerrotype process improved but was eventually replaced by newer and better processes. In the United States, daguerrotype photographs were popularly called “tintypes.” By 1851, Scott Archer of England developed the process of coating glass plates with sensitized silver compounds. The plates were referred to as “wet plates” and the process had reduced the exposure time to one-tenth that of the daguerrotype process. FIGURE 2: 1839 aerial photograph of a supposedly empty street in Paris, note enlargement. FIGURE 3: Nadar caricaturized in 1862. Once a technique was established for taking pictures, an adequate aerial platform was needed for taking aerial photographs. The only platforms available at the time were balloons and kites. In 1858, Gaspard Felix Tournachon (later known as "Nadar") captured the first recorded aerial photograph from a balloon tethered over the Bievre Valley. However, the results of his initial work were apparently destroyed. On the other hand his early efforts were preserved in a caricature (Figure 3) prepared by Honoré Daunier for the May 25, 1862 issue of Le Boulevard. Nadar continued his various endeavors to improve and promote aerial photography. In 1859, he contacted the French Military with respect to taking "military photos" for the French Army's campaign in Italy and preparing maps from aerial photographs. In 1868 he ascended several hundred feet in a tethered balloon to take oblique photographs of Paris (Figure 5). On October 13, 1860, James Wallace Black, accompanied by Professor Sam King, ascended to an altitude of 1200 feet in King's balloon and photographed portions of the city of Boston (Figure 4). A cable held the balloon in place. Black, the photographer, made eight exposures of which only one resulted in a reasonable picture. This is the oldest conserved aerial photograph. He worked under difficult conditions with the balloon, which although tethered, was constantly moving. Combined with the slow speed of the photographic materials being used it was hard to get a good exposure without movement occurring. He also used wet plates and had to prepare them in the balloon before each exposure. After descending to take on more supplies, King and Black went up again with the idea of not only covering Boston but also recording the surrounding countryside. However, they encountered other problems. As they rose, the hydrogen expanded causing the neck of the balloon to open more. This resulted in the gas flowing down on their equipment and turning the plates black and useless. In addition, the balloon took off and they landed in some high bushes in Marshfield, Massachusetts, about thirty miles away from their beginning point. It was obvious that the balloon possessed problems in being an aerial platform. FIGURES 4 AND 5: Black’s 1860 photo of Boston and Nadar’s 1868 photo of Paris. 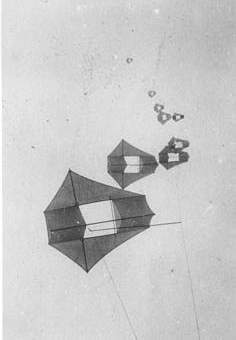 M. Arthur Batut (Figure 6a) took the first aerial photographs using a kite. It was taken over Labruguiere, France in the late 1880s. The camera, attached directly to the kite, had an altimeter that encoded the exposure altitude on the film allowing scaling of the image Figure 6c). A slow burning fuse, responding to a rubber band-driven device, actuated the shutter within a few minutes after the kite was launched. A small flag dropped once the shutter was released to indicate that it was time to bring down the kite. Batut took his first aerial photograph in May 1888. However, due to the shutter speed being too slow, the image was not very clear (Figure 6b). After some modification to the thickness of the rubber band a good shutter speed was obtained. FIGURES 6a-c: Batut, his first aerial photograph taken over Labruguiere, France, and his kite with camera mounted in the middle. In 1906, George R. Lawrence took oblique aerial pictures of San Francisco after the earthquake and fires (Figure 8). Using between nine and seventeen large kites to lift a huge camera (49 pounds) he took some of the largest exposures (about 48 x 122 cm or 18 x 48 in.) ever obtained from an aerial platform. His camera was designed so that the film plate curved in back and the lens fitted low on the front, providing panorama images (Figure 7a). The camera was lifted to a height of approximately 2,000 feet and an electric wire controlled the shutter to produce a negative. Lawrence designed his own large-format cameras and specialized in aerial views. He used ladders or high towers to photograph from above. In 1901 he shot aerial photographs from a cage attached to a balloon. One time, at more than 200 feet above Chicago, the cage tore from the balloon, and Lawrence and his camera fell to the ground. Fortunately telephone and telegraph wires broke his fall; he landed unharmed. He continued to use balloons until he developed his method for taking aerial views with cameras suspended from unmanned kites, a safer platform from his perspective. He developed a means of flying Conyne kites in trains and keeping the camera steady under varying wind conditions. This system he named the 'Captive Airship' (Figure 7b). FIGURES 7a-b: Lawrence's camera and one of his Captive Airships. FIGURE 8: One of Lawrence's 1906 photographs of San Francisco. In 1903, Julius Neubranner, photography enthusiast, designed and patented a breast-mounted aerial camera for carrier pigeons (Figure 10). Weighing only 70 grams the camera took automatic exposures at 30-second intervals along the flight line flown by a pigeon. Although faster than balloons they were not always reliable in following their flight paths. The birds were introduced at the 1909 Dresden International Photographic Exhibition. Picture postcards of aerial photographs taken over the exhibition were very popular. They were used at other fairs and for military surveillance. Two sample pictures are provided below (Figure 9a-b). One can see in the one picture the tips of the bird's wings as it flew across a palace. FIGURES 9a-b: Aerial photographs taken by pigeons. FIGURE 10: A pigeon with a camera mounted to its breast. In order for the pigeons to carry such small cameras and take several pictures in one flight, a new type film and a smaller camera system were needed. In the 1870s, George Eastman, born in the rural community of Waterville in upstate New York, was an accountant in Rochester. After working five years in a bank, he became bored with the monotony of the job. In 1878, he decided to take a vacation to the island of Santo Domingo and re-evaluate his life. To record his trip he acquired a wet-plate camera outfit. However, he found the camera and assorted darkroom equipment to be cumbersome and bulky. He would need a small wagon to carry all of the materials and equipment, an arrangement not suited for taking pictures on one's vacation. He soon forgot about the trip to Santo Domingo and became intrigued with the idea of developing a better film and camera system. In 1879, Eastman discovered the formula for making a successful gelatin emulsion covered dry-plate and built a machine for coating dry plates with the emulsion. These developments led to the invention of rolled paper film. The resulting prints were sharp, clear and free from paper grain distortion. In 1889, his company, Kodak, introduced flexible celluloid film and the popularity of photography soared. He now needed a camera to take advantage of the new film. In 1900, outfitted with a simple lens and the ability to handle rolled film, the one-dollar Kodak box camera, called the Brownie, made Kodak and photography almost synonymous. Eastman had not only revolutionized the field of photography but set the stage for new developments in the field of aerial photography. His work was shortly followed in 1903 by the Wright Brothers' first successful flight of a heavier-than-air aircraft. Another type of aerial platform was available. FIGURE 11: Aerial photograph taken by Alford Nobel of a Swedish village. Also in 1903 Alfred Maul, a German industrialist and an engineer, developed a rocket system to take photographs from the air. The system was later referred to as the Maul Camera Rocket. A number of people prior to Maul had conducted various tests with rockets, but basically no practical application was found for them. In 1891 Ludwig Rahrmann had patented a method of attaching a camera to a large caliber artillery gun or rocket. His work inspired Maul to develop his system. In the meantime Alfred Nobel (Nobel Prize fame) had built the first rocket carrying camera. Figure 11 shows an aerial photograph taken by Nobel of a Swedish village in Karlskoga parish. Nobel’s rocket camera system took photos only about 300 feet above land, limiting the field of view to small areas. FIGURE 12: Sketch of Maul’s Rocket-Camera System. FIGURE 13: Aerial photograph taken from a Maul Camera Rocket. Maul’s camera was located in the hood section of the rocket and mounted at an oblique downward inclination. The lens looked through a hole in the hood. Wings or blades were provided to keep the rocket from rotating and changing direction, and thereby, maintain the focus of the lens toward the ground. At a flight’s highest point a time-fuse raised the lens’ shutter and at about the same time opened parachutes stored below the camera. The parachutes gradually lowered the rocket to the ground. Figure 12 illustrates the procedures and is modified from Maul’s 1904 U.S. patent design. In 1904 the Maul Camera Rocket took an image (Figure 13) of a North German landscape from about 1900 feet altitude. From the beginning a military use for this technique was in mind. In August 1906 secret tests occurred before military observers at a German firing range. Following the tests he developed gyroscopic-stabilized plate cameras in 1907 to ensure stable flight and sharper images. Next the rocket camera system was tested by the Austrian Army as a means for reconnaissance in the Turkish-Bulgarian War in 1912/1913. Work on the system was not continued after 1913 due to planes being more effective for taking aerial photographs. FIGURES 14 and 15: Aerial photographer during World War I, and a French air field. At the beginning of World War I the military on both sides of the conflict saw the value of using the airplane for reconnaissance work but did not fully appreciate the potential of aerial photography. Initially, aerial observers, flying in two-seater airplanes with pilots, did aerial reconnaissance by making sketch maps and verbally conveying conditions on the ground. They reported on enemy positions, supplies, and movements; however, some observers tended to exaggerate or misinterpret conditions. In some cases, their observations were based on looking at the wrong army. From above, identifying one soldier from another was not easy. One time a German observer indicated that an English unit was running around in great disarray and appeared to be in a state of panic. The English were playing soccer. Some English observers started using cameras to record enemy positions and found aerial photography easier and more accurate than sketching and observing (Figure 14). The aerial observer became the aerial photographer (Figure 15). Soon all of the nations involved in the conflict were using aerial photography. The maps used by both sides in the Battle of Neuve-Chappelle in 1915 were produced from aerial photographs. By the end of the war the Germans and the British were recording the entire front at least twice a day. Both countries possess up-to-date records of their enemy's trench construction (Figure 16). England estimated that its reconnaissance planes took one-half million photographs during the war, and Germany calculated that if all of its aerial photographs were arranged side by side, they would cover the country six times. The war brought major improvements in the quality of cameras; photographs taken at 15,000 feet (4,572 meters) could be blown up to show footprints in the mud. FIGURE 16: Trench development observed at 2000 feet on July 31, 1916. Like Eastman, Fairchild was born in a small upstate New York town called Oneonta. His father, George W. Fairchild, manufactured time clocks and adding machines. His company along with two others later became IBM and George Fairchild was the company's first president. He also served for twelve years in the U.S. House of Representatives. In his initial years of developing a camera Fairchild benefited from his father’s wealth and influence. FIGURES 17 and 18: Fairchild’s aerial camera system mounted for vertical photography and equipped for automatic operation. To the right is the intervalometer and in the foreground is the viewfinder. To the right is a portion of the aerial map of Manhattan Island. Although by 1920 Fairchild had built an aerial camera superior to anything that had existed previously, the war was over and the military was reluctant to invest in the camera except for two training models. He turned his attention to using his camera system for non-military purposes. In 1921, he took a series of 100 overlapping photographs and made an aerial map of Manhattan Island (Figure 18). This aerial map was his first real commercial success and it was used by several New York City agencies and businesses. In 1922, Newark, New Jersey contracted with him to map its bay area. A Connecticut town discovered 1800 buildings not on its tax rolls using an aerial map, and another town, East Haven wanted to reassess its properties but discovered that to conduct a ground survey would take five years and cost $80,000. Fairchild did the work in 60 days at a cost of $7,000. The Canadian company, Laurentide Paper and Pulp, hired him to survey the large, inaccessible forest regions of Canada. Within the first year, 510 square miles were mapped. Fairchild was demonstrating that aerial photography had many non-military uses and could be a successful venture commercially. By the mid-1930’s, Fairchild Aerial Surveys was the largest and most commercially successful aerial photography company in the United States. Fairchild found it necessary to enter the field of manufacturing airplanes in order to have a good solid aerial platform. The open-cockpit biplanes were totally unsatisfactory. He produced high-wing cabin monoplanes. An enclosed, heated cabin protected the camera equipment as well as the photographer and pilot from the weather elements. He now had three companies, one to produce aerial cameras, another to conduct aerial surveys, and a final one to build planes suited to undertake aerial photography. Fairchild’s brilliant camera designs and his strong commitment to aerial photography brought aerial mapping to full maturity. Before his death in 1971, he saw his cameras carried on Apollo 15,16, and 17, and while astronauts explored the lunar surface, his cameras mapped the moon. In addition to Fairchilds' accomplishments between World War I and World War II,several other significant developments occurred within the field of remote sensing during this period. These developments are outlined below. 1920's - First books on aerial photo interpretation were published. Reeves’ Aerial Photographs, Characteristics and Military Applications was published in 1927 followed by Winchester’s and Wills’ Aerial Photography, a Comprehensive Survey of Its Practice and Development and Pendleton’s Map Complication from Aerial Photographs in 1928. McKinley’s Applied Aerial Photography became available in 1929. 1924 - Mannes and Godousky patent their research on developing multi-layer color film. Their work led to Kodak producing Kodachrome in 1935. Among the first users of color film for aerial photography was Goddard in 1937. Color film was not used much for aerial photography until after World War II. Film speeds were too slow; camera lenses designed to correct for color were not readily available; atmospheric haze problems existed; and film processing was not consistent. 1920's-30's - Interest in the peaceful uses of aerial photography increased during this period. Aerial photography had been taken for more than two-thirds of continental United States, most of which was taken in the later half of the thirties. Three federal agencies, namely the Soil Conservation Service, Agricultural Adjustment Administration, and the Forest Service, accounted for most of the work in aerial photography. Other agencies involved in aerial photography work included the U.S. Geological Survey, the Tennessee Valley Authority, the Coast and Geodetic Survey, and the Army Air Corps. 1934 - Twelve people met in Washington, D.C. and from this meeting The American Society of Photogrammetry was founded. The Society’s journal, Photogrammetric Engineering, was established at the same time. Today, the Society is known as The American Society of Photogrammetry and Remote Sensing and its journal has been renamed Photogrammetric Engineering and Remote Sensing. 1935 - Launched from the Stratobowl near Rapid City, South Dakota, the balloon, Explorer II, carried Captains Albert Stevens and Orvil Anderson, and an assortment of instruments to a world record altitude of 72,395 feet (22,066 kilometers). Sponsored by the National Geographic Society, one of the flight’s most dramatic successes related to aerial photography. The first photographs showing the division between the troposphere and the stratosphere and the actual curvature of the Earth were recorded. Also, stunning photographs of South Dakota and surrounding states were taken. A review of the numerous applications of aerial photoreconnaissance and interpretation during World War II cannot be adequately covered in this instructional module. Thus, just one example will be provided. Peenemunde, the German experimental station for rocket and jet plane development, was located on the Baltic Coast and in 1937 Wernher von Braun and his rocket team were moved to Peenemunde. It was here that after six years of hard work von Braun and hsi team developed the A-4. On October 3, 1942 the A-4 was successfully launched reaching an altitude of sixty miles. It was the world's first launch of a ballistic missile and the first rocket ever to go into the fringes of space. In 1943 the A-4 was ordered into production and renamed the V-2. Shortly thereafter, V-2 rockets were launched against England. In late 1942 the British Secret Intelligence Service was informed about a new rocket being developed at Peenemunde. An aerial photoreconnaissance plane was sent on June 23, 1943 and obtained the first photo of the V-2 rocket (Figure 19). This aerial photo shows Test Stand VII at the German Testing Center with a V2 rocket on its trailer inside of the test firing area. It also shows possible anti-aircraft gun positions on top of an adjacent building. On August 17 and 18, 1943 the British sent its bombers to Peenemunde and rather than bombing the facility in general, precise targets were selected based on the excellent aerial photography previously obtained. After the bombing a second aerial photoreconnaissance plane was sent to gain photography for assessing the amount of damage (Figure 20). FIGURES 19 and 20: Photo (left) taken June 23, 1943 of the V-2 test lunch site at Peenemunde. Photo (right) taken after bombing raid. During the 1950’s, aerial photography continued to evolve from work started during World War II and the Korean War. Color-infrared became important in identifying different vegetation types and detecting diseased and damaged vegetation. Multispectral imagery, that is images taken at the same time but in different portions of the electromagnetic spectrum, was being tested for different applications. Radar technology moved along two paralleling paths, side-looking air-borne radar (SLAR) and synthetic aperature radar (SAR). Westinghouse and Texas Instruments did most of this work for the United States Air Force. FIGURE 21: A U-2 landing.